At Eternity’s Gate is an oil painting that Vincent van Gogh made in 1890. The painting was completed in early May at a time when he was convalescing from a severe relapse in his mental health troubles, and just two months before his death, generally accepted as a suicide. 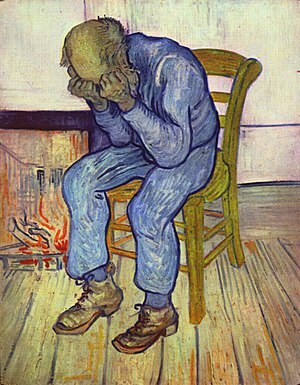 The painting was based on an earlier pencil drawing (1882) which van Gogh called Worn Out, of an old pensioner and war veteran, Adrianus Zuyderland, at a local poorhouse in The Hague. Van Gogh lost his battle for sanity, but did he cling to faith in God as Powers believes? His faith was certainly conflicted, but was he hanging on by a thread? Does the painting At Eternity’s Gate reflect only despair at the prospect of death, or does the title and van Gogh’s letter to his brother suggest some kind of faith and hope in the face of death? The bullet van Gogh shot into his chest was deflected by a rib and did not hit any major organs. He lived for 29 hours before dying of infection. What did he think about during that time? Van Gogh certainly felt forsaken. Jesus himself felt that way, crying out from the cross, “My God, My God, why have you forsaken me?” But then in his very last words, when he was himself at eternity’s gate, Jesus prayed “Father, into your hands I commit my spirit.” That is the very best prayer for us to remember when we approach that gate. This is a photo of van Gogh’s Bible, originally owned by Vincent’s father, the Reverend Theodorus van Gogh. It is a nineteenth-century reprint of the Dutch Authorized Bible, published in 1714. The Bible was found in the 1980’s on the premises of the church in Leiden. 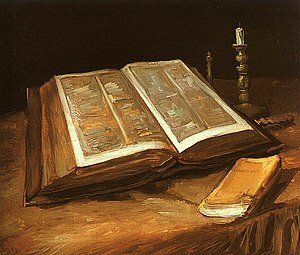 In 1885 Van Gogh painted this volume in his Still Life with Bible. A crack in the spine still causes the book to fall open at Isaiah 53, precisely the page at which the Bible lies open in the painting. Van Gogh would have found much comfort and hope in that chapter, as it foretold the coming life, ministry, and death of Jesus. Isaiah 53:3 — He was despised and rejected by mankind, a man of suffering, and familiar with pain. Like one from whom people hide their faces he was despised, and we held him in low esteem. Isaiah 53:4-5 — Surely he took up our pain and bore our suffering, yet we considered him punished by God, stricken by him, and afflicted. But he was pierced for our transgressions, he was crushed for our iniquities; the punishment that brought us peace was on him, and by his wounds we are healed. that you bestow in the sight of all, on those who take refuge in you…. 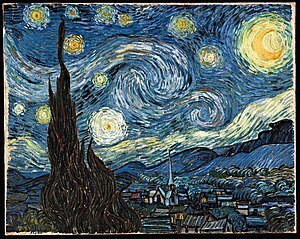 The song says nothing about van Gogh’s religious beliefs, but it is a beautiful song about his life.